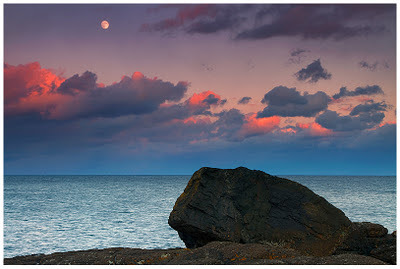 The full moon rises over Black Rocks in Marquette, Michigan. Ebony being the rocks of Black Rocks, Ivory being the rock that is the Moon. Complete opposites meet and work together to compliment one another. Technical details: Canon 7D, Canon 24-105 L (@50mm), 2-stop reverse graduated neutral density filter, ISO 100, F/11, 1/10th of a second.